Height adjustable Street Comfort allows a lowering of 10-40mm depending on the vehicle. This allows for the flexibility to improve the look while adding custom products like aftermarket wheels. At the same time the lowering has a positive effect on the driving dynamics and road contact. 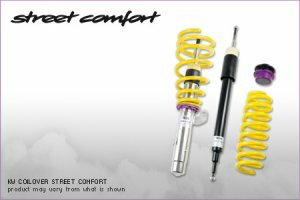 With this discreet but effective lowering more spring travel will be retained to combine a comfortable spring with harmonic dampener, this way the best driving comfort is guaranteed. Front Lowering: 1.4" to 2.5"
Rear Lowering: 1.4" to 2.1"
06: Wheel spacers may be necessary if using stock tires/wheels.